We join the 1st day of final series racing here at the 470 Junior World Championships, featuring 102 of the world’s best young 470 teams. 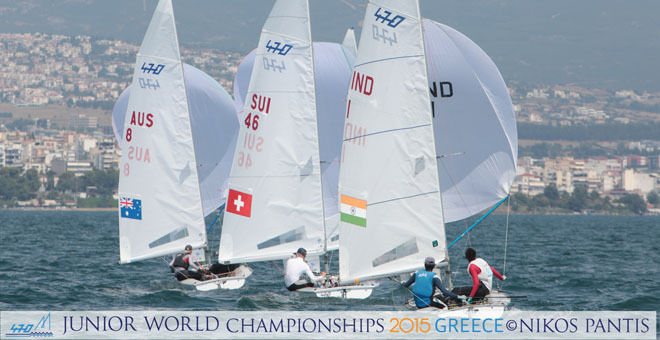 In men’s gold fleet racing, the top 30 were set to cross swords, in the typical thermal breeze of 10 knots! 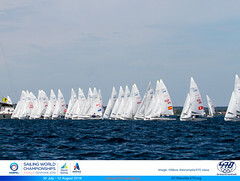 Among the usual frontrunners are teams from Spain, Great Britain and France – nations with a proven pedigree in the 470 Class. 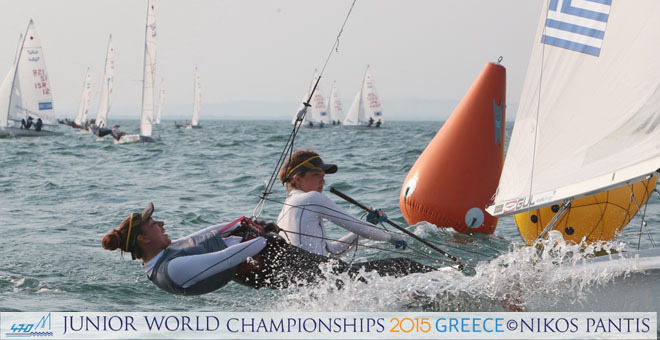 All competitive sailors have the same goal, to perform well and keep on learning and improving. On the race track, battles are intense. Shoreside the long-standing friendships resume. At the end of the day, sailing ‘unites’ people! 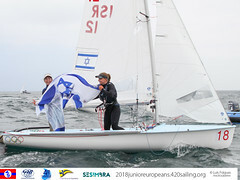 Back to the race track, where the host nation’s Bozi and Klonaridou, bounced back from their shocker of an opening day, a 15th and black flag penalty in the women’s fleet, to knock out a win. No easy feat in this world class fleet. 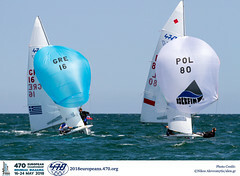 Italy’s Di Salle and Dubbini raced another consistent day –a performance to be expected from former 420 Junior European Champion and ISAF Youth Worlds gold medallist, Di Salle. But it is defending World Champions, Lemaitre & Retornaz of France, who look ready to pounce, now their disqualification penalty from yesterday is discarded. Racing in the men’s gold fleet intensifies, with the world ranked #28 partnership of Pirouelle and Sipan taking an easy win in the first race today. A blow to the campaign of Hungary’s brother partnership and overnight series leaders, as they scored their first double-digit finish and drop down the leaderboard. The thermal breeze returned again today, steadily increasing in the afternoon, and virtually guaranteed to favour the left side of the race track. Teams now know this, and will have to stick with the pack if they want a front of fleet finish. Tomorrow, we will meet the top sailors, and get to know their personalities and lifestyle, as well as take a whistle stop tour of Thessaloniki.